Kits, Conversion, Repair, Service & Accessories from the Best. Driving a Harley Trike is a luxury experience. The touring control of a trike makes each ride a great time with your friends or family. Taking the time to service your Harley trike is important. You need the ability to bring your trike to a well educated mechanic who is familiar with Harley conversion kits. 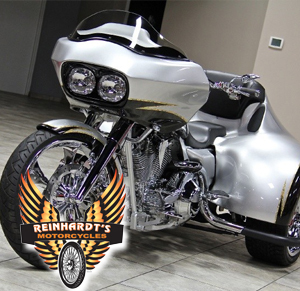 When you’re in Tampa, Reinhardt’s Motorcycles is the most recognized name in Harley trikes. 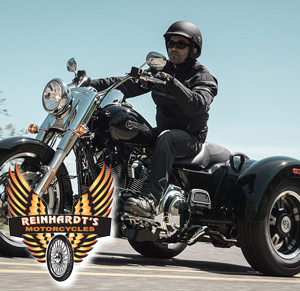 Reinhardt will treat you just like family and service your trike with your safety in mind. Walk ins always welcome for preferred times call 813-909-2299. Reinhardt’s Motorcyles is a certified independent Harley repair shop located on North Dale Mabry Hwy. Reinhardt believes having the same mechanic servicing your trike on a consistent basis yields the safest possible results. In-shop experienced mechanics are educated on a weekly basis to ensure that our shop standards are current with Harley best practices. We have trikes for sale on premises or simply come in for a trike conversion. Ride your ride in to Reinhardts today! Located in Northern Tampa.